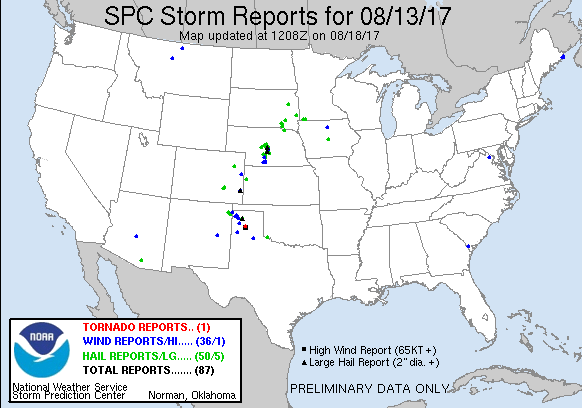 August 13th featured a shortwave impulse moving across the Northern Plains with a weak surface low over South Dakota slowly drifting east. A trough extended southwest from the low across Northern Nebraska into Colorado where another surface low resided. Dewpoints were expected to be in the mid to upper 60s across Nebraska while surface winds were expected to be generally southerly with some backing along a stationary front draped across the northern portion of the state. SPC had issued slight risk across Central Nebraska and southern High Plains where models were showing scattered storms. However, the biggest threat was in Nebraska where large hail could be an issue and SPC had outlined a hatched area for hail greater than 2 inches possible. In the morning, the plan looked like heading north out of Grand Island towards Broken Bow where the front was setup and hope for a play there not too far from home. I took off from home just before 20z on a last second decision to finally chase for the day and began the trek northwest along Highway 2. Shortly after leaving a mesoscale discussion was issued for central Nebraska with very large hail as the primary concern. 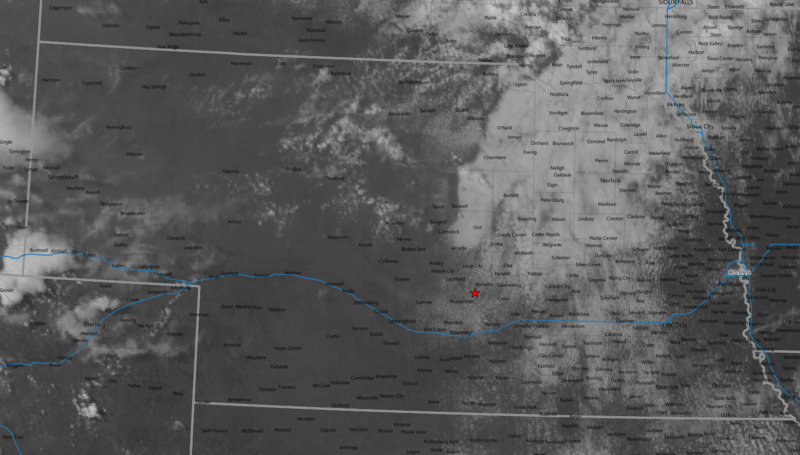 At about 20z it became clear via visible satellite that northwest of Broken Bow was probably going to be where storms initiated as a field of cumulus began to develop from there northwest to Valentine. 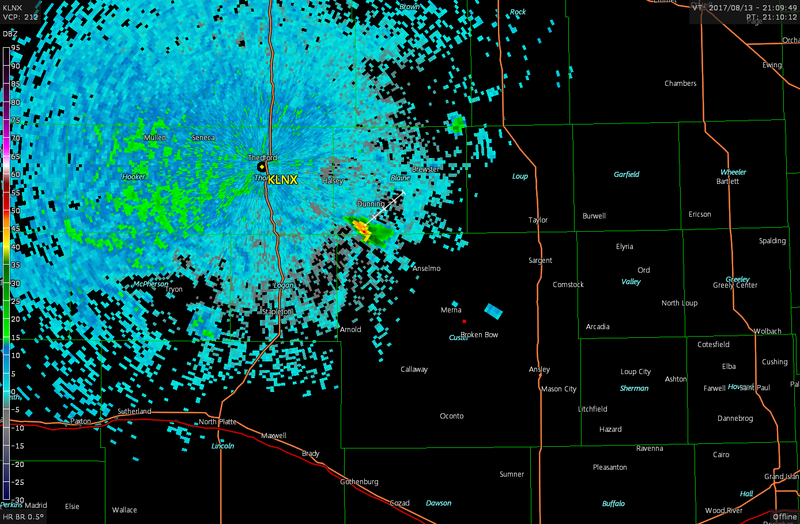 I arrived in Broken Bow at 21z and right after the first cell of the day started to pop on radar to the northwest. Within a half hour or so it had developed into a fully fledged supercell. 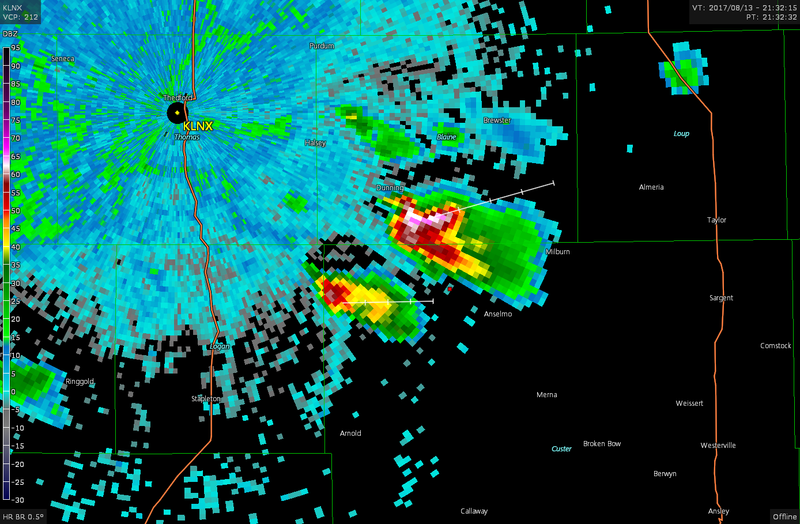 I intercepted the storm just northwest of Anselmo a little after 2130z as it began to split. I’d end up tracking the right split as it turned southeast and traveled straight down highway 2. The storm initially had a pretty flat base to it all the way around and a deep precipitation core. Rotation wasn’t evident on the radar so I opted to sample the hail core and found some 1.25″ hail near Anselmo. 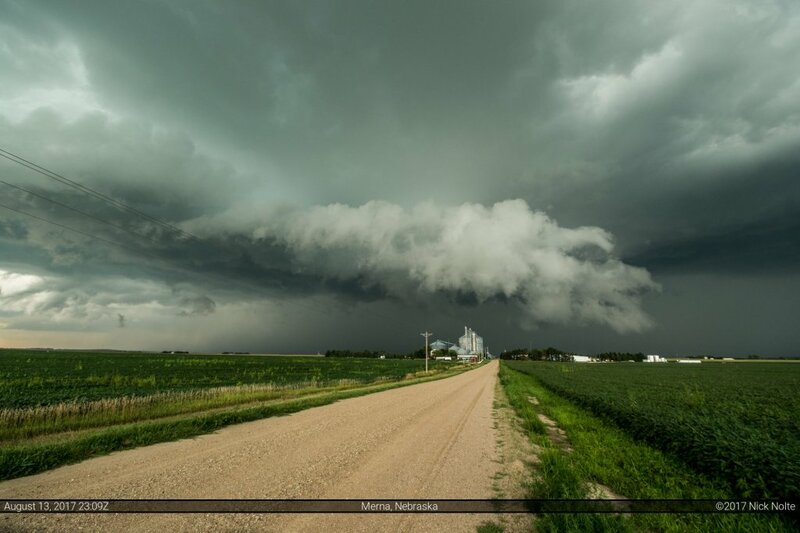 I continued to follow the storm down highway 2 I realized the core of the storm was strengthening as it was making a beeline to Broken Bow which was hit the day before by hail producing storms that shredded trees and damaged vehicles with golf ball sized hail. Turns out three separate hail cores would go through Broken Bow on this night with larger hail than before, with reports of Baseballs in Merna, Tea-cups (3″) in Oconto where I ran into 2″ hail myself. I continued to follow the storm through Ansley where darkness finally started to set in and end the chase for me.